Health problems can happen to anyone at any time, and those problems can leave people unable to move around their home safely. Making the necessary repairs to make homes accessible is an expense many homeowners cannot afford, especially seniors on fixed incomes. That’s why home repair programs play an important role in the struggle for affordable housing by allowing people to remain in their homes. For most of his life, 75-year-old Salvador Gonzales was able-bodied and hardworking. A native of Austin and an Army Reserves veteran, Gonzales and his wife Feliz raised six children with the money they made from carpentry and clerical work. Twenty-five years ago, they purchased their home in East Austin. In 2006, Salvador suffered a heart attack. He underwent quadruple bypass heart surgery and doctors installed a pacemaker. He also began suffering from a circulatory disease in his legs that made it difficult for him to get around without a walker or a wheelchair. The situation got worse and Salvador experienced three painful falls in his bathtub. 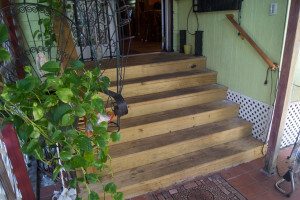 Also, the steep steps leading into and out of the Gonzales home had become difficult and dangerous to navigate. By 2014, Salvador’s home sweet home was also an obstacle course for him. Fortunately, Salvador was a client of Meals on Wheels and More (MOWAM), and MOWAM caseworkers discussed his situation with the organization’s Home Repair Program. 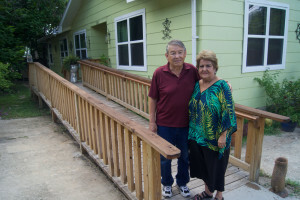 With help from partners, Rebuilding Together Austin and the City’s Architectural Barrier Removal program, Meals on Wheels made numerous improvements to the Gonzales home. 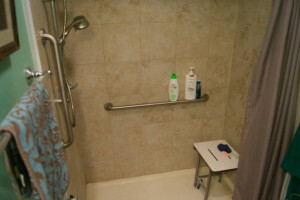 That includes a 25-foot ramp leading to their front door, a staircase with railing outside the back door, walk-in showers and shower seats in two bathrooms and general beautification work. Meals on Wheels and More’s Home Repair Program provides free home improvements for its clients when there are unhealthy or dangerous living conditions present. Clients must have a total household income at or below 80% of the current Median Family Income for Travis County. The program receives funds from City of Austin General Obligation Affordable Housing bonds, Texas Department of Housing and Community Affairs, Texas Veterans Commission, Travis County CDBG and The Home Depot Foundation. The Gonzaleses are deeply grateful to Meals on Wheels and More and all those who made their home more accessible for Salvador. Click below to hear their heartfelt message.